Every now and I then I try to take some time to think about the focus of this blog and the direction it is going. In the most recent case, I got the feeling that perhaps I have giving too discouraged or negative an impression on the blog lately….focusing too much on the challenges and problems, and not enough on the positives. 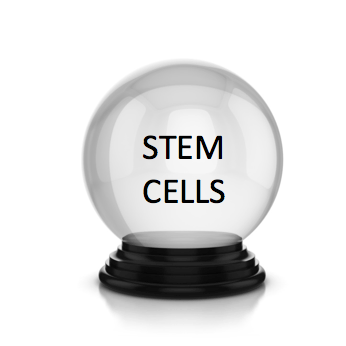 In fact in general, as I stare into a metaphorical stem cell crystal ball, I am quite optimistic about the stem cell field and its direction. As a result of this big picture contemplation, in today’s post I tell you why I am feeling so optimistic about stem cells. I’m upbeat for one thing because never before have we had so many smart, energized people working on stem cells as today. We have a whole new generation of young scientists, some of whom I met at the CIRM Bridges Meeting in San Francisco recently where I spoke. Their energy and creativity are boundless. We also have veterans of the stem cell field with wisdom and enthusiasm too. In short, the stem cell field is maturing and has a whole range of scientists involved. We are also seeing stem cell medical products becoming ever closer to becoming realities as new therapies for patients and many more trials are on the way. So as the number of total researchers and clinicians involved in stem cell research and therapy development is going up so too are the number of clinical trials. The number of patient advocates is increasing as well. I also see a new willingness amongst different groups in the stem cell arena to talk with each other. Communication between different traditionally separate teams (academia, industry, grant funders, regulators, lawyers, patient advocates, investors, etc) is still a challenge, but I believe there are more bridges and more discussions ongoing now than ever before. I hope that I have been a part of getting people to talk. We may not always agree, but we need to communicate and we have a lot to teach each other. We must cooperate to move the whole field forward. I don’t have any illusions that we can all sit around a stem cell campfire singing kumbaya and holding hands, roasting stem cell-produced synthetic hotdogs or burgers (I’m not sure I’d want that anyway), but we can talk and work together instead of always butting heads. I’m also excited to see increased public awareness of stem cells and growing efforts at educational outreach paying off. I also think the stem cell field has gained a needed sense of pragmatism and realist as it has matured. This is what new ISSCR President Janet Rossant called “a new realism in terms of the challenges ahead.” We’ll need that toughness and willingness to confront problems. In the end there are many challenges ahead of us, but I am optimistic that in as short as a decade stem cells will seem more common to everyday people as medicines and there will be quite a number of proven safe and effective stem cell treatments on the market. In short, we’ll have advanced in major ways from where we are today. Some investors in stem cell biotechs are likely to be quite rich in a decade, while others unfortunately will probably have lost a lot of money. There will probably be some scandals as well as some towering achievements. Some diseases will be cured, while others won’t even be treatable by stem cells. It’s hard to know which will be which, but overall the stem cell field will continue to accelerate new cures and treatments as well as advancing our understanding of biology. I can’t wait to see what a decade will bring (stay tuned for a future post where I make more specific long term predictions).